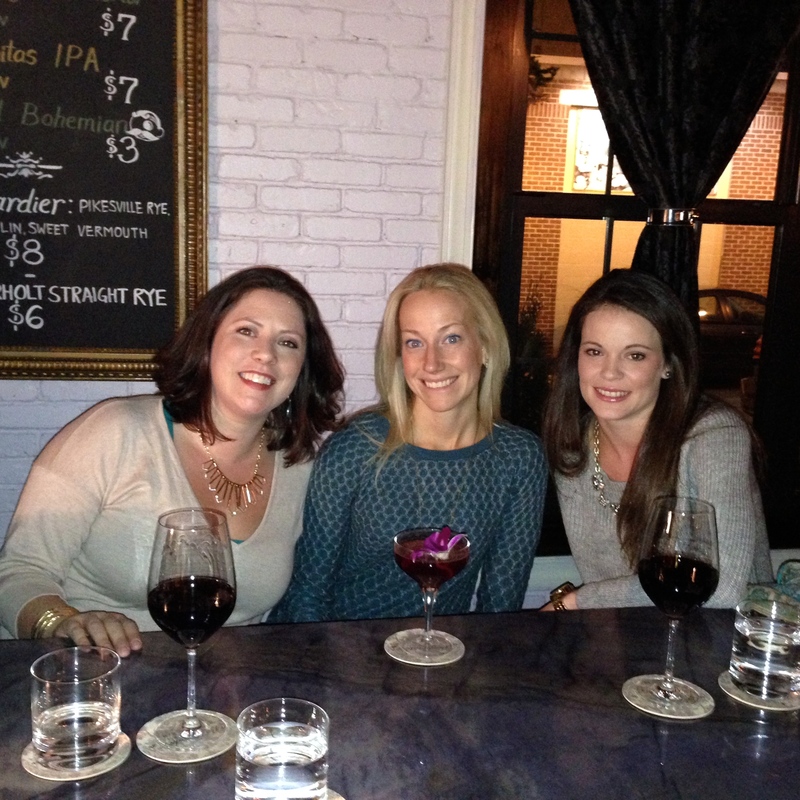 Bookmaker’s Cocktail Club – eating my way through Charm City! This is no longer the old divey karaoke bar and it’s exactly the kind of place that Federal Hill needs. The walls are a neutral gray, the large bar is very classy with chandeliers and textured wall of premium liquor bottles. Plus, the very little outside decor makes it seem fancy. And yet, there is a warm, cozy and inviting feeling in this bar. I ate here shortly after they opened. They haven’t been open for 90 days yet (I think it’s closer to 60 days). They have confirmed why I should kept to that rule, although delish – the menu and chef have already changed once since they have opened. I’m excited though; I loved Chef Sarah from Le Garage. They have a few choices for red wines, but none of my normal go tos. I asked the bartender for her thoughts on the Côtes-du-Rhône She said it was medium bodied and had very low tannins. Sounded like a winner for me. This one is a 2012 Domain St. Gres from France. There are some smokey and olive notes on the nose, but I mostly smelled the plum or berry like aroma. Don’t let the dark berry color of this wine fool you. It has ripe fruity flavors, with what I think was a hint of sweet herbs. The bartender was right; the wine finished with subtle tannins. Jamie went with their Heart Shaped Box cocktail. 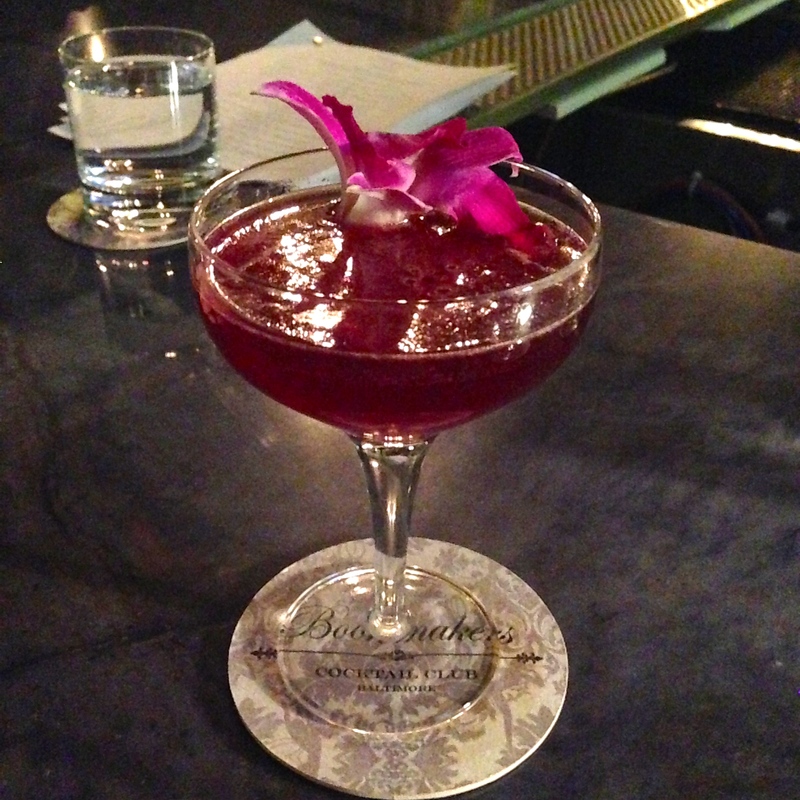 They shake bootlegger vodka with creme de mure (a blackberry liqueur) with a little thyme and fresh lime. Lastly, they top it with a little LaLuca prosecco and a very pretty flower. So pretty, in fact, that about 3000 people said, “oooo, what did you get with the flower?”. She loved it, but she is a big fan of sweet, fruity drinks. The bubbles, of course, are always fun. This entry was posted in Charm City, Drinks, Federal Hill, Hooray!!! Winner!. Bookmark the permalink. We’ve only had one chef change! Sarah is our executive chef still.